If your job involves business correspondence, then you certainly write request letters, occasionally or on a regular basis. This could be a job request, promotion or meeting requests, request for information or referral, favor letter or character reference. Such letters are difficult to write and even more difficult to write in such a way that encourages recipients to respond willingly and enthusiastically. As to request for money letters, all sorts of sponsorship, donation, or fundraising requests, you would agree that it often requires a miracle to get a response : ) Of course, I cannot guarantee that our tips and letter samples you will do the miracle, but they will definitely save you some time and make your writing job less painful. Time-saving tip! If you are communicating by email, then you can save even more time by adding all these sample business letters directly to your Outlook. And then you will be able to insert any sample into the message you are composing or replying to with a mouse click! All it takes is the Outlook Template Phrases plug-in that you can see in the screenshot on the right. Once you have it installed, you won't have to type the same phrases over and over again. Just double click the template on the plug-in's pane and find the text inserted in the message body in a moment. All your formatting, hyperlinks, images and signatures will be in place! Don't hesitate to check it out right now; a fully-functional 15-day evaluation version is available for download. A business letter is a formal way of communication and that is why it requires a special format. You may not care of the letter format too much if you are sending an e-mail, but if you are writing a traditional paper business letter, the below recommendations may prove helpful. It is considered a good practice to print out a business letter on standard 8.5" x 11" (215.9 mm x 279.4 mm) white paper. Sender's Address. Usually you start by typing your own address. In British English, the sender's address is usually written in the top right corner of the letter. In American English, the sender's address is placed in the top left corner. You needn't write the sender's name or title, as it is included in the letter's closing. Type only the street address, city, and zip code and optionally, phone number and email address. If you are writing on stationery with a letterhead, then skip this. Date. Type a date a few lines below the letterhead or return address. The standard is 2-3 lines (one to four lines are acceptable). On-Arrival Notices (optional). If you want to include a notation on private or confidential correspondence, type it below the reference line in uppercase, if appropriate. For example, PERSONAL or CONFIDENTIAL. Inside Address. This is the address of the recipient of your business letter, an individual or a company. It is always best to write to a specific person at the company to which you are writing. The standard is 2 lines below the previous item you typed, one to six lines are acceptable. Attention Line (optional). Type the name of the person whom you're trying to reach. If you wrote the person's name in the Inside Address, skip the Attention Line. Body. This is the main part of your letter, usually consisting of 2 - 5 paragraphs, with a blank line between each paragraph. In the first paragraph, write a friendly opening and then state your main point. In the next few paragraphs, provided background information and supporting details. Finally, write the closing paragraph where you restate the purpose of the letter and request some action, if applicable. See tips on writing persuasive business letters for more details. The closing is typically typed at the same vertical point as the date and one line after the last body paragraph. Capitalize the first word only and leave three or four lines between the closing and the signature block. If the salutation is followed by a colon, add a comma after the closing; otherwise, no punctuation after the closing is required. Signature. As a rule, a signature comes four blank lines after the Complimentary Close. Type your name below a signature and add a title, if needed. Typist Initials (optional). This component is used to indicate the person who typed the letter for you. If you typed the letter yourself, omit this. Usually the identification initials include three of your initials in uppercase, then two or three of the typist's in lowercase. For example, JAM/dmc, JAM:cm. But this component is quite rarely used these days, in very formal business letters. 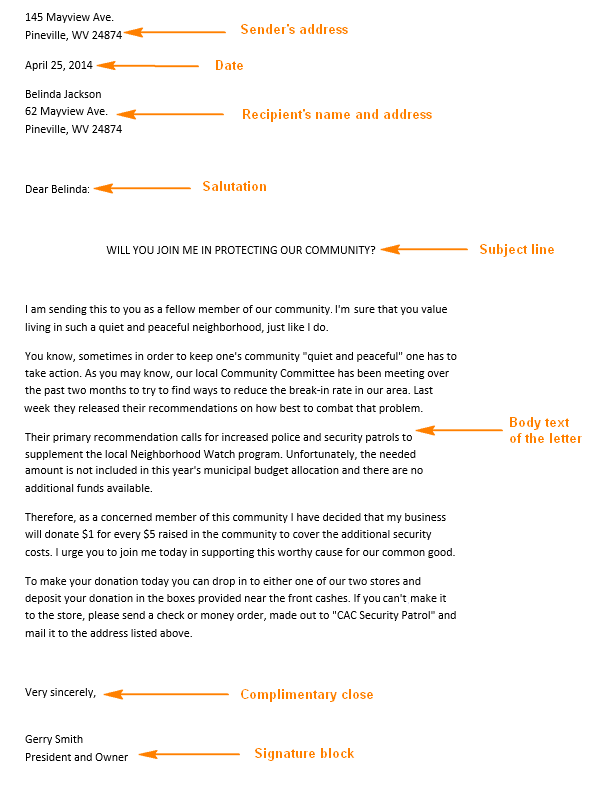 Below you can see a properly formatted sample donation letter. It's always easier to understand from examples, isn't it? Below you will find 10 strategies to write your request letters in such a way that they convince your reader to respond or act. Know your addressee. Before you start composing you request letter, ask yourself these questions. Who is my reader and how exactly can they help me? Are they decision makers or will they just pass along my request to a senior officer? Both the style and contents of your request letter will depend on the reader's position. Make your letter easy to read. When writing a request letter, don't digress and don't confuse your reader by drifting off your main point. Avoid long, crammed sentences and paragraphs because they are intimidating and hard to digest. Use simple, declarative sentences instead and break long sentences with commas, colons and semicolons. Start a new paragraph when you change a thought or idea. "In every regard, my qualifications appear to be consistent with the desires expressed by your advertisement and based on the voice of your company's blogs, I really think that I was meant to be a [Position] in your company." "I have good skills and experience in [Your area of expertise] and I would be most grateful if you consider me for any suitable position." Remember, if your request letter looks easy to read, it has a better chance to be read! Add call to action. Put action in your request letters wherever is possible. The easiest way is to use action verbs and the active voice rather than passive. Convince but do not demand. Do not treat your addressees as if they owe you something. Instead, catch the reader's attention by mentioning common ground and emphasize the benefits of acting. Write in a friendly way and appeal to the reader's feelings. Though you are writing a business letter, don't be superfluously businesslike. Friendly letters make friends, so write your request letters in a friendly way as if you are talking to your real friend or an old acquaintance. We are all humans, and it may be a good idea to appeal to humanity, generosity, or sympathy of your correspondent. Remain polite and professional. Even if you are writing an order cancellation request or complaint letter, remain polite and courteous, simply state the issue(s), provide all relevant information and be sure to avoid threats and calumny. Mind your grammar! Rephrasing a well-known saying - "grammar counts for first impressions". Poor grammar like poor manners may spoil everything, so be sure to proofread all business letters you send. Review before sending. When you have finished composing the letter, read it aloud. If your key point is not crystal clear, write it over. It's better to invest some time in re-writing and get a response, than make it fast and have your letter thrown away in a bin straight away. And finally, if you've got a response to your request letter or the desired action is taken, don't forget to thank the person. Here you can find sample thank you letters for all occasions. Below you will find a few examples of request letters for different occasions. I hope you are doing well. I have warm memories of your remarkable leadership and support for teachers during my employment at XYZ High School. Presently, I am applying to XYZ school district and am required to submit three letters of recommendation. I am writing to ask if you would write a letter of recommendation on my behalf. I would like to provide you with some background information that may assist you, should you decide to write this letter <your background information>. Attached, you will find a copy of my most recent résumé. Please feel free to contact me if you need any additional information. I look forward to hearing from you, and I thank you in advance for your time. Thank you for submitting your resume in response to the <position> we advertised. In addition to your resume, we also need three references and a list of past employers for the past three years, along with their phone numbers. Our policy is to thoroughly review the background of each candidate in order to select the most suitable person for this job. Thank you for your assistance. We are looking forward to hearing from you. <Applicant> has applied with our company for a position in our <department>. He / she has given your name as a character reference. Would you be kind enough to provide us with your written evaluation of this person. Please rest assured that your response will be treated with confidentiality. Thank you in advance. I am sending this to you as a fellow member of our community. I'm sure that you value living in such a quiet and peaceful neighborhood, just like I do. You know, sometimes in order to keep one's community quiet and peaceful one has to take action. As you may know, our local Community Committee has been meeting over the past two months to try to find ways to reduce the break-in rate in our area. Last week they released their recommendations on how best to combat that problem. Their primary recommendation calls for increased police and security patrols to supplement the local Neighborhood Watch program. Unfortunately, the needed amount is not included in this year's municipal budget allocation. Therefore, as a concerned member of this community I have decided that my business will donate $ for every $ raised in the community to cover the additional security costs. I urge you to join me today in supporting this worthy cause for our common good. To make your donation today you can drop in to either one of our two stores and deposit your donation in the boxes provided near the front cashes. If you can't make it to the store, please send a check or money order, made out to "XYZ" and mail it to the address listed above. I am writing you to ask you for a favor that I hope you could do for me. In less than three months I will be taking the <Examination>, with the hope to enter the <University or College>, where they have the best graduate school program for the course that I am interested in. The school places an extremely high emphasis on a student's success in the exam, which is why I feel extremely pressured to get an above average score on the Graduate Record Examination. Because you recently graduated with a degree in <science>, you are naturally the first person I thought of when considering who I could approach to assist me. I am not asking for too much time, I would really appreciate any pointers you could give me and a few lessons on the <sections>, which I feel are my weakest points. I hope that you will give me a positive response. Thank you in advance. Since the product you delivered is not of satisfactory quality <is not fit for the purpose>, I am entitled to have it <repaired / replaced> and I would request that you confirm that you will do this within the next seven days. I also require you to confirm whether you will arrange for the <item> to be collected or will reimburse me for the cost of returning it. And this is all for today. Hopefully, this information will help you compose properly formatted business letter in general and persuasive request letters in particular, and always get the desired response. Thank you for reading! 102 Responses to "Writing persuasive request letters: business letter format, tips and samples"
I George Danna browsing this website for such help in letter writing would like to say thanku for you online sevice.Cheers! Could you please help me to write a letter..........? I have to write h letter, Imagine the new product from food industry, write a Persuading letter to customers to buy it. I would be most greatful if you could tell me more about your country culture. Hi, I wrote a letter requesting for office space two months now I have not received any reply. how do I write a follow up letter? I'm really sorry, we only provide general tips and tricks for writing letters. We don't assist with custom tasks. Are You give to me a sample of application ,advance take any company? Can you help me create a persuasive letter telling neighbors that a home for aids patients would be a good thing in their neighborhood? I’m really sorry, we only provide general tips and tricks for writing letters. You can try to create a draft and then ask someone on this letter writing forum. Great job!Many thanks for this. Please i want sample letter on how to share my ideas with reliable organizations.Thanks again. I'm really sorry, we only provide general tips and tricks for writing letters. We don't assist with custom tasks. You can try to create a draft and then ask someone on a letter writing forum. Anybody knows send sample letter.. Please can anyone here help with a good memo persuading my manager to introduce faxfood line to our company. Sorry, we cannot assist you with your task. Please try to create a draft and then ask someone on a specialized letter writing forum. I need a letter of request for a company. I worked for this company for 13 years. And the company didn't want to pay me the agreed and signed contract bonus of the year 2015. So I want to write very attractive letter of request to the CEO and the Owners of the company to release this agreed bonus money as soon as possible and I need also as the company terminates me automatically to give me advance payments of 2 months’ salary in searching a work. I'm really sorry, we only provide general tips and tricks for writing letters. Please ask someone on a special letter writing forum. thanx a lot 4 this information. hello, anybody can me help to write this persuasive letter. EDENZ resorts is a small chain of boutique resorts based in the Northland region of NZ. It was founded by the current managing director Mr. Tim Tweeter. After many successful years of progressive growth, the company in recent years has found itself in financial difficulties. Mr. Tweeter has been negotiating prospective offers from several offshore buyers. He is particularly inclined towards a lucrative offer by Shanghai Tourism Holdings Ltd. (SHT), a Chinese hospitality company rapidly expanding base around the world. · Mr. Tweeter will be a member of the new board, and will be a minority share holder. However, he will no longer be the CEO of EDENZ. · SHT will appoint a new CEO for EDENZ. Mr. Wong, from Hong Kong, who has successfully lead SHT’s Macau operations is the most likely appointment. Mr. Regan. General Manager of EDENZ Resorts, is concerned that the new board and CEO appointed by SHT may not be aware of the company’s unique Kiwi culture. The success of EDENZ resorts has been largely due to its unique Kiwi spirit. Mr Regan fears that the new leadership may jeopardize the unique selling point of EDENZ resorts. He also fears operational problems, since the staff at EDENZ is primarily Kiwi and a Chinese leadership may create clashes in working culture. Mr. Regan decides to write a persuasive letter to Mr. Tweeter, 85 Airedale Street, Auckland CBD, 1010, presenting his concerns. He wants Mr. Tweeter to insist with SHT that the new CEO appointed should either be of the same Kiwi culture or of a similar culture. Can you plzz plzz help me on how to write a convincing letter for my boss so that i can make him understand my problem of not coming to office.. plzz suggest me some tricks... Please do reply.. Plzz..Its important... Thank you.. Tips are really helpful but can i use these tips for professional purposes..?? I want to request for a refrigerator in a company, i buy their products and I sell their products. So I wanted them to help me with a fridge so I can use to sell their products. Thank you very much for sharing your tips on writing prose. Hi pls help me how to write to inform my boss to pay may contribution in my pag-Ibig.. Or to lump sum may contribution because I have a. Plan to loan a house a lot..
Dear madam,assuming I need a job at a bank but will prefer a branch office of I am applying to head office where do I place the branch's address? pls can someone help me write a letter. you spoke to your supplier on the phone about changing the terms of delivery. write an email to her confrming that would you like 20 days insted of 30 days. Could you please help me write a cover letter request to nzta for endorsement I2 and I4 on my drivers licence. Send me a sample of this.how to write and what to write. Thanks. please help me in writing the letter to supplier for requesting the flavours for trial even though the samples that was sent before had no longer with us. we need the supplier to send us the same samples. Could you give me a tip or trick on how to write an email asking department heads if they would like an intern for their department. Pls help me to write a best letter in email, to offer our list of item to potential cuatemer. To client regarding the fees 5% being hold by them as their new regulation although it is not stated in the LOA. I need a request letter to our sole supplier. We already had contracts of supplying the material for one project. And we again need more material for our new project. If anybody knows please help me. Its hard trying to pick what to optimise on my own blog, is offsite SEO still working? samples and tips - The newest addition to my weekly read! I am very pleased to inform you that your letter writing skills help us very much. There is a correct way of expression of your feelings through writing a professional letter. I am a Dental hygienist working on percentage. Patient who cancel on the day are a loss in finances and also make me feel inadequat. I am sending a reminder of the appointment SMS a week before the appointment. Is there something I can add to the sms to make them see that they have a responsability to keep the appointment. How can I persuade without loosing my self respect? i have problem in writing reports, business letters and spelling, please could train me on how to develop myself. It's a great platform where we are putting our request and getting good ideas about to sending emails but trust me i dont know how to write a letter to anybody and even dont know good english. Please help write a letter to request a vehicle to convey items from one location to another. Can you help me prepare a letter requesting to apply color printing charges to a b/w printing charges instead since we are not meeting the quota per month of b/w printing. how to write a letter for company to confirm , there is no discount on some food items. kindly confirm me . I need help writing a letter to the CEO of the company my husband worked for, requesting that he check into, or even correct. an error by his company that caused the company they insure their employees with to deny my husband's life insurance policy. I wish to appeal to his decency and ethics, but I do not know how to keep his interest so he will read the entire letter or act on it. Write a letter, to persuade HR Manager of an XYZ multinational, marketing your training firm. This letter should help your company to start a new business venture with the XYZ company. It was very grateful in writtong this letter to be the sports prefect i the school thak u. Can you give me a letter sample on how to request for a draft agreement on an urgent basis because I want to execute the Agreement as soon as possible. 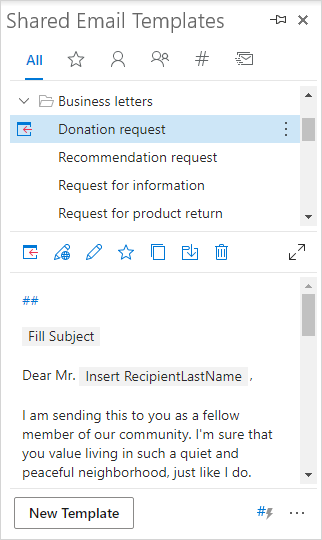 Please help me with a request letter, how to befin the letter. Just the format please, I want to request for what am using in the office, its a small coming, so they said I should letter a request letter for them to approve before I will go and buy them. Tanx. Please assist to draft a letter, that we want to enter our brand into a department store. May you assist me write an urgent letter to my boss who is in Zimbabwe to show up in Botswana because the business needs him, we cannot proceed with business without his say. I sent textile chemicals samples to various parties from my end. They took Sample test and then after if they satisfied then they give us order. Now I require the letter format to this process. Means I need draft how i approach the parties which i sent the chemical samples. i would like to ask how to make letter for requesting a space in a mall for charity purposes. and its sample. Can you help me how to write endorsement letter. This principal company has a sister company who will be the new supplier in the supermarket. I did not get proper information which I wanted,but someward it was helpful. I have company. So Im asking on how to proposal letter to company asking to supply them with whatever products they want at the moment.